River Medway, view from Sun Pier. Photo © 2014. Keith Greenfield. All rights reserved. The Medway Towns consist of Strood, Rochester, Chatham, Gillingham, and Rainham. By road – Medway can be reached via major motorways. From north, south and west via M25/A2/M2 (junctions 1-4). From London via M25/M26/M20 (junctions 4 for A228 or 6 for A229). From the Channel ports/Eurotunnel via the M20 (junction 6 for A229 or via A2/M2 for junctions 1-4). By air – Medway is 43 miles from Gatwick Airport via the M23/M25/A2/M2. It’s 75 miles from Heathrow Airport, via the M25/A2/M2 and 52 miles from Stansted via, M11/M25/A2/M2. By sea/tunnel – The area has links to the Channel ports and Eurotunnel. Medway is 40 miles from Dover and Folkestone and can be reached via the A2/M2 and M20/A229. 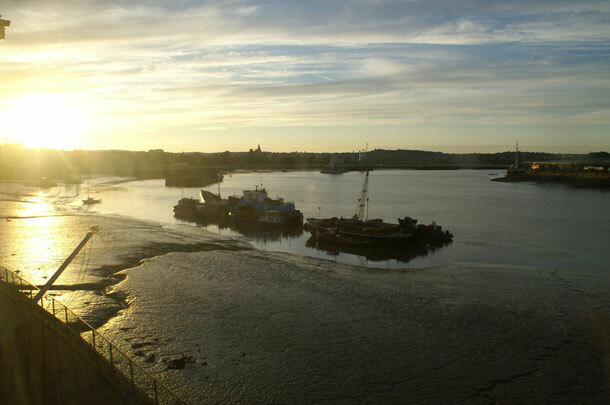 By rail – Medway has five main rail stations: Strood, Rochester, Chatham, Gillingham and Rainham. All have frequent services from London Victoria and Charing Cross. High speed trains also link Medway to London’s St. Pancras International in just 35 minutes. Southeastern offers a range of value for money train fares. Ebbsfleet International Station is 20 minutes by coach from Medway connecting Medway to Europe by Eurostar. Public transport – The area is well served by public transport. Once here you can easily move around using local train, bus and taxi services. Arriva Southern Counties provides a frequent 10-minute bus service daily between historic Rochester and Chatham Maritime. It also operates several other services throughout Medway, Gravesend, Maidstone and West Malling from the Pentagon Shopping Centre bus station. For more information visit Medway Council’s public transport page. For where to park in Medway visit Medway Council’s parking page.